Broke Dishwasher Review - SCAM exposed? NOT a REAL PROGRAM! 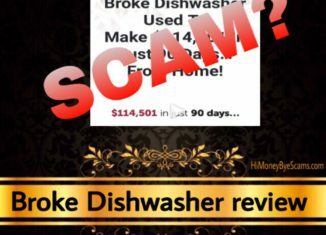 Home > Online opportunities > Broke Dishwasher Review – SCAM exposed? NOT a REAL PROGRAM! Looking for a genuine Broke Dishwasher review? Are you wondering if brokedishwasher.com is a scam or legit system that can help you generate $114,501 in 90 days? If that’s what you are questioning, I’m glad that you have landed on this post because here you will find the answers to your questions. There are so many fraudulent sites out there, so let me congratulate you for doing your due diligence! That’s the way to avoid scams and discover the real way to make passive income every day! When it comes to Broke Dishwasher, it’s nothing new and the sales presentation doesn’t tell you everything you need to know, so keep reading to learn what they have been hiding from you! 2 What is Broke Dishwasher about? 3 Does Broke Dishwasher work? 3.2 Does it only cost $47? 4 Is Broke Dishwasher a scam? What is Broke Dishwasher about? I received an email concerning the Broke Dishwasher system, so I was like “is this system different than the others or just another scam?” and decided to check it out. The moment I saw the sales page, I thought it was another “too good to be true” system that didn’t work as advertised because of the high-income claim “$114,501 in 90 days”. From my experience, I can say that most systems that make high-income claims tend to be get-rich-quick schemes that only work to make the owners richer. However, I didn’t want to think that Broke Dishwasher was like the others so I did my homework before reaching a final conclusion. The sales presentation is about a man named Teo Vee, who says that he was a “broke dishwasher” who didn’t have any special skills or money to invest and he started using visualization to get what he wanted. After meeting many people who laughed at him, he then found someone at church who listened to what he was saying. He said he knew a 14-year-old kid that was making good money with a simple website. I have heard lots of times the sob story he tells in other scammy videos, so I’m not sure if the story he tells is true. Just the fact that he claims you can start making money within a short period of time is a big red flag, since this is not how making money online works. No matter the method or business model that you use, it takes time and effort to earn a decent income. So don’t be fooled by whoever claims you can make money fast. 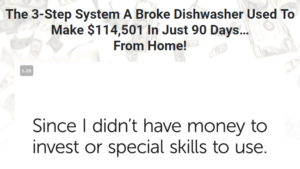 Broke Dishwasher is said to be a 3-step system that comes with 6 videos, and after watching them and applying what you learn, you apparently can start making thousands of dollars online. However, it’s not that simple. Note that Teo is an experienced marketer and has been creating pages like brokedishwasher.com to get people to buy into this program, so he’s no newbie and definitely knows more than he claims. He makes this system sounds so good but he’s hiding important details that you need to know, so I recommend that you pay attention to what I’m about to reveal, since this is something to take into consideration before making a final decision. According to Teo, all the 14-year-old kid had to do to make money was to copy and drag some pictures, copy some text and hit go. This is what he allegedly did to make people spend money on his page. Sounds simple and fasy, right? I know it’s easy to get excited when you hear how easy it is, but it is really not. Teo also says that he made $213 overnight using this system, which sounds very unrealistic to people who know how the Internet marketing world works. He’s definitely targeting people who don’t know what it takes to make an income online. Step 1 – Claim your page where online shoppers buy products and then someone else sends the product to them. Step 2 – Let people visit your page. Step 3 – Collect your cash, click a button to have the other company create and ship the product to your customer. This can give you an idea of what you have to do, but he still does not mention some important details. He doesn’t mention the name of this business model, which is dropshipping, a form of ecommerce that consists in selling other people’s physical products. The concept is quite simple: you set up your online store with Shopify, you list products that you don’t own, and when someone buys one of these products, you tell the supplier to ship it to the buyer. All of this definitely takes time and effort. You can’t expect to make money within a short period of time because you first need to do some research on the products you want to sell, the prices, your competitors… and then you need to list them by adding pictures and descriptions. Once you have listed them, you need to work on getting visitors to your store, which is essential because without people coming to your store, you cannot make sales. Getting traffic is something that will require you to invest a lot of time or money. If you invest more time than money, you need to be prepared to work hours and hours before making your first cent, and if you decide to invest more money than time, you need to be prepared to lose some of the money you invest. Like I said in the title of this post, Broke Dishwasher is not the name of a real program. It’s a page that is being used to get people into a program called My Ecom Club. This is something that Teo doesn’t say in the sales video, but I believe you need to know it because this is what you will be paying for if you decide to get involved. He has created other pages like Broke Dishwasher, such as Online Innovations and The Ecom Freedom Blueprint. In case you are wondering, why doesn’t he promote this program under his real name? Well, one of the reasons is that different sales pages target different people, and another reason is that he probably doesn’t want you to know the name of the real program until you have made the payment. You see, there are negative My Ecom Club reviews out there, so he knows that if you found them, you probably wouldn’t buy it. This is something that many product owners do to prevent potential customers from finding what they don’t want them to know. For me, not being transparent about the real program is a red flag because it means that they are trying to hide something important. Does it only cost $47? Teo claims this is risk-free because you can get a refund for the initial $47. But the truth is, this is far from being risk-free because there are upsells and other costs. The reason you get a “personal startup advisor” is because there are $1,000 in upsells, so don’t you think that you are getting this advisor for only $47. Once you have made the initial payment, they will try to get you to spend thousands of dollars on high-ticket products. In case you don’t have that money, they will try to convince you to get a loan so that you can afford to purchase their expensive stuff. One of them is a done-for-you option that costs at least $2K. As you can read in their terms of service section, they will require you to buy additional products. So it’s clear that building this business costs waaay more than $47. When it comes to refunds, if you don’t ask for your money back within 30 days, you will not get a refund. Not only that, there are no refunds if you don’t cancel a subscription before its rebill period and there are no refunds for high-ticket products either. The whole sales page is very misleading because it gives you false expectations about making money online and it doesn’t mention everything you need to know to make a wise decision. It’s being marketed as a get-rich-quick scheme, also known as an autopilot system that only needs to get activated to make money. This alone is a complete red flag because systems like this don’t exist. When it comes to My Ecom Club, I would not call it a scam because you get something for your money and it can help you build your dropshipping business. With that said, this is definitely not for everyone. This is only for people who are willing to put in the work and invest thousands of dollars to build this business. No matter the method you follow, it takes time and work to build a business, but not all businesses require you to invest that amount of money. If you are interested in making money with dropshipping, you don’t need to spend thousands of dollars because there are training and courses that are way cheaper than My Ecom Club. What you end up doing is up to you, but my final conclusion is that I do not recommend Broke Dishwasher. The good news is that you don’t need to spend much money before you start making your first dollar. There are lots of high-ticket programs that take advantage of newbies or people who are desperate to make money but don’t know how it works. Scammers prey on their hopes and dreams to make money at their expenses. So here I am to tell you that it’s possible to start earning passive income online without buying expensive products. I’m grateful that I found a legitimate business model that has given me a way to make a 4-digit monthly income online. This business model is similar to dropshipping, but it doesn’t require me to deal with refunds or spend money on paid traffic. Yes, that’s right. I don’t need to spend a dime to get visitors, isn’t it cool? With that said, it still takes time and effort, so this is not for people who are not committed to learning or taking action. Building this business will be fun because you will be doing something you love. To be more specific, you will be researching, talking and writing about a topic you have a passion for. How cool is that? You probably have lots of doubts now, so I hope that, after reading my free guide, you will have a clear idea of what business model I use and why it works. There are lots of people who started from zero and still managed to succeed. So who says you can’t do it too? If you believe you can, you will! You will be also getting tons of help from people who are on the same path as you, so know for sure that you are not alone! I’m so excited for you to get on the right track to build your business! Remember that when you want something you have never had, you need to do something you have never done! I hope this Broke Dishwasher review has been useful to you and you will make the best possible decision. Thank you for educating me on this topic of interest. i am quite skeptical of online business, especially one I have to pay in advance. But with this blog post i definitely now know what’s involved and how to go about it. i hope it help me and I am planning to recommend it to a friend. thanks again and warm regards! Thanks for this informative article. I have always wanted to master a working guide on how to make money online. At the right time you showed up with the free guide. The broke dishwasher program in y opinion is not a scam . I have learnt a lot in this review which I will put to practice to help my online Monday making career. Also looking forward to studying your free guide. Thanks a lot. Great article! Sadly, as you mentioned there are hundreds of fake sites that claim instant money. I agree, people with less knowledge become easy targets for them. Broke Dishwasher is just like any other one. I’m glad that there are people like you who take up the initiative to educate people about these scams. Thanks for sharing! Have always had the feeling that Broke Dishwasher is a scam! When ever I visit any page and all they emphasize more on is getting rich quick,making fast money,getting double of what you are investing. When I come across such statements, I get furious and take my time to study. Even checking for testimonial videos online is not longer safe as they are not real, many people are being paid money to act fake in other to capture the attention of people. A big thank you to Miren, you are really doing a fantastic job by taking your time to research and exposing them all. Good job!!! Damn, I don’t think I have yet seen an make money online scam that is this scammy……from not telling the real name of the program to upsells of up to $2k. These people go to so much length to make people sponsor their expensive lifestyles even if it means pushing them into deep debts. People really need to do a lot of research before they pay a ime to all the make money online programs . And I can’t thank people like you enough,for taking the time to do the research and then warn people about these scammers. Home Income System SCAM – Review exposes TRUTH about Ad Link Posting! Sharesjob.com review – Is it a scam or not?